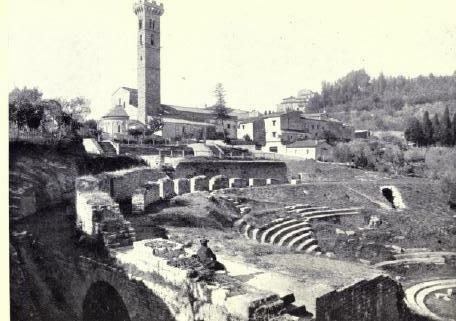 But the main interest of Fiesole to most people is not the cypress-covered hill of S. Francesco; not the view from the summit; not the straw mementoes; not the Mino relief in the church; but the Roman arena. The excavators have made of this a very complete place. One can stand at the top of the steps and reconstruct it all the audience, the performance, the performers. 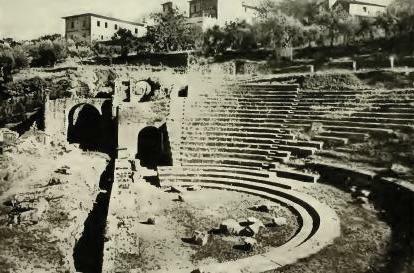 A very little time spent on building would be needed to restore the amphitheatre to its original form. Beyond it are baths, and in a hollow the remains of a temple with the altar where it ever was; and then one walks a little farther and is on the ancient Etruscan wall, built when Fiesole was an Etruscan fortified hill city. So do the centuries fall away here! But everywhere, among the ancient Roman stones so massive and exact, and the Etruscan stones, are the wild flowers which Luca Signorelli painted in that picture in the Uffizi which I love so much. After the amphitheatre one visits the Museum with the same ticket a little building filled with trophies of the spade. There is nothing very wonderful nothing to compare with the treasures of the Archaeological Museum m Florence but it is well worth a visit. ‘Brutto paese!’ quoth Trombino, a snug youth for choice… Once past this fatal place you have the grim bulk of the fortezza towering over your way. As my own cortege crawled up, Iremember that a little company of madmen strayed about us, going slowly homewards to Volterra – fit pinfold! – herded by one man in a Government cap. He seemed glad of my company, so I conversed with him a little. His madmen were very old, but had, he told me, all been homicides in their day. Solitary confinement had done its work; they would lay hands suddenly on no other men. So the law allows them to roam at will, to pick wild-flowers and twist garlands for their white pows: a peaceful ending to their labours. They looked upon us. our equipage and advance, with mild unwondering eyes. Once we had been grist for their long knives, but now were less than the flowers in the hedgerow. After life’s fitful fever… A straggling suburb succeeded, a row of drab houses, a cheerless trattoria with unglazed windows, pigs, chickens, children, stern-faced women in men’s hats – here are disjected notes. A diligence came tearing down the hill, full of scared pale people escaping from Volterra; but we crept ever upwards and trailed painfully by the walls, the watch-tower, the great boulder of the fortress, and entered the doomed city by the Florence Gate. Trombino flogged the horses into a feeble canter, and brought us up to the door of the old inn with some sort of a rattle. Cut a thin reed from scream-beset Scamander For hazard of this music! No one came out to receive us. It might have been a dead-house; and so it was. Windtortured abode of madmen and grey murderers! Heart of earthquakes, fallen, still falling Volterra! It wanted but this. But I must endeavour to be calm. To our notions—whose inns are as good as our hotels are bad – there is no comfort, but much hospitality in a Tuscan inn. At Volterra, the fact is that I had neither; but there were reasons. Mr. Carmichael, in a recent and agreeable work, shows that he found something to his taste. His landlord, however, was not dying of typhoid as mine was. 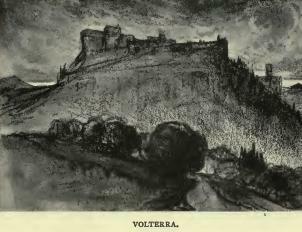 To me all Volterra was exactly accursed, from the landlord to the land. A raw sea-mist was blown upon a searching wind through all the corridors of the house. Mad old women whispered and chuckled to themselves in corners, pawing and patting, as it seemed to me, waxen figures of the stricken host. Now and then there came a scurrying of fear-fanned feet, now and then the clanking of pails, the sudden banging of doors. A daughter of the house was in tears, her sister in hysterics; the doctor spat upon the floor, signifying his diagnostic pother. Death alone sat hale in the guest-chambers, and had bespoken the chief seat at the feast. Clearly, all these things were far from Mr. Carmichael, who was able to ruminate with unencumbered mind upon the Etruscans, the alabaster industry, and the landslip – as most pleasantly he does in his little Tuscan book. To me the gloom, the shadow, the cruel sea-wind with its tainted burden of fog, blighted the eyes, and perhaps struck a palsy upon the judgment. But I am by no means so sure that this, which has been foretold by the road, is not sealed to Volterra by history. On the first floor [of the Florence Archaeological Museum] the fine collection of bronzes and bucchero is being re-arranged at the time I write. The bronze statues of Menrva, the Orator, the Chimaera and the fragments of the bronze group of Diana in her chariot, are all here. Among the painted vases the Francois vase reigns supreme. This vase, which I have already described, was found in fragments at Chiusi in 1845 and bought by the Grand Duke of Tuscany. It was restored as well as the best experts of the day knew how and stood for half a century, first in the Uffizi, afterwards in its present position, when one disastrous day an official of the gallery, in a fit of mania, dashed it to the ground and it was again reduced to a heap of broken potsherds. 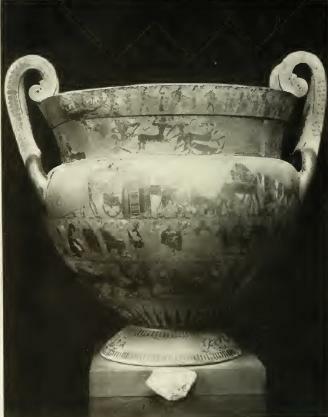 It was however immediately put in the hands of restorers and the experience of the last half century has, it appears, taught many lessons in the art of restoration, for when, after several years of the minutest care and labour, it was again exposed to view it was in an even better state than when its second misfortune overtook it.